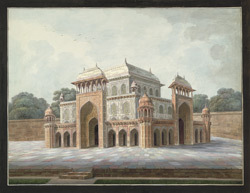 Watercolour of the tomb of I'timad al-Daula in Agra, by an anonymous artist working in the Murshidabad style, c. 1790-1800. Inscribed on the back in pencil: 'Tomb of Etmaum Ul Dowlah - Agra' and in ink: 'Etemaum-Dowlah's Tomb opposite Agra on the Left Bank of the River Jumna.'. This drawing is a view of the tomb of I'timad al-Daulah at Agra. This tomb was built by Nur Jahan, the favorite wife of the Mughal Emperor Jahangir (r.1605-27) in memory of her father Mirza Ghiyath Beg. A white marble rectangular building, the tomb stands in a garden on a stone platform situated on the banks of the river Jumna opposite the Fort-Palace complex. In the central chamber are the tombs of Itmad-ud-Daula and his wife. The delicately carved marble screens give a gentle light to the interior while inlaid pietra dura work adorns the walls and floors. The tomb is set within a charbagh, a four-fold garden.